The SilverBlack Card - A nightclub guest list card for Hong Kong - Sign up before 30th March to enjoy the current SilverBlack Card Price! Home News 最新消息 Sign up before 30th March to enjoy the current SilverBlack Card Price! Sign up before 30th March to enjoy the current SilverBlack Card Price! 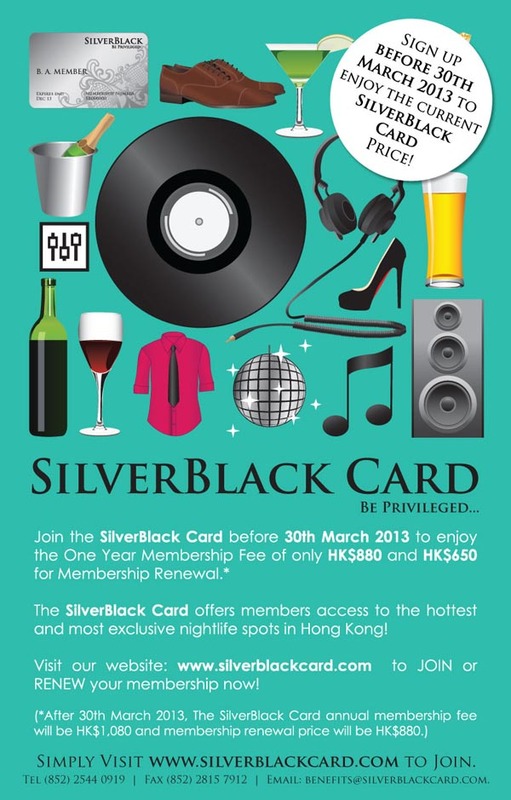 Sign up before 30th March 2013 to enjoy the current SilverBlack Card Price! On the 30th March 2013 The SilverBlack Card annual price will change to HK$1,080 and the card annual renewal price will change to HK$880. So if you are thinking of joining then do so now before the end of the month at only HK$880 for the year. If you are an old member and have not renewed you can still do so at only HK$650. The SilverBlack Card now offers club entrance benefits for 8 of the best clubs in Hong Kong and you can cover the cost of the card in just 3* visits to these great venues during your one year membership. If you are plannning to renew your card you can do so HERE.